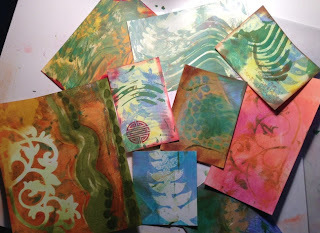 Here are my first experiments with the gelli plate. Since I tend to like a simple, "less is more" design, I felt it was more interesting to crop the prints looking for an interesting focus. There will most definitely be more experimenting! I got out my poly paper and started cutting some stencils and masks, as we learned in Michelle Ward's Frond Chronicles class. I wanted an old, fossil look here. 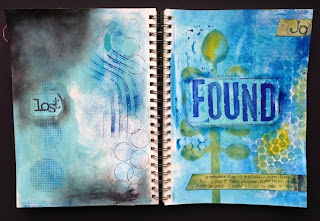 Gesso pages first, then add layers of paint and stencils, blotting some color after spraying with water. Then stencil using a dry brush. 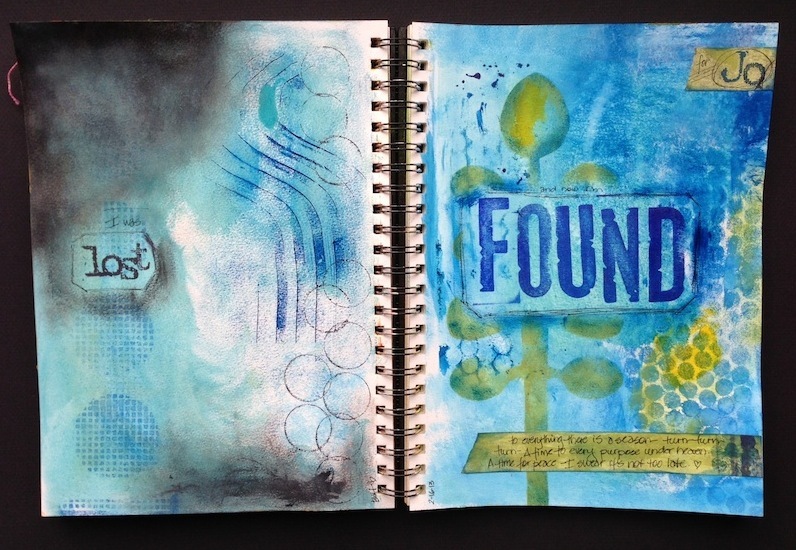 I added pieces of an old farmer's almanac as the finishing touch! Have fun! 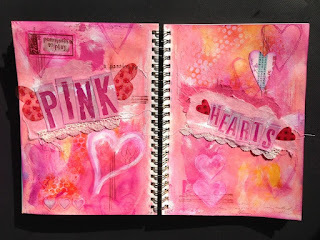 Passion for Pink.. and hearts! It was just fun to play without a real concern for the final product. I just love these colors. A dear friend from my Cedar Crest days has found me! So I dedicate these pages and inspiration to her! Thanks, Jo! You can visit her blog too! 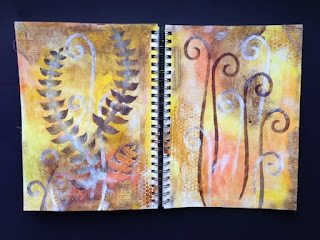 The left page was hanging around a while, so I quickly got some color down on the right a few days ago -- paint spread with a card, some spraying thru circle templates, some glaze. The layers of black and stenciling happened this morning. I also included some Turn, Turn, Turn lyrics as I played my "Feeling Groovy" playlist to remind me of younger days. I've been blocked for months and this literally happened in fifteen minutes. Hope my muse (and Jo) sticks around for a while.